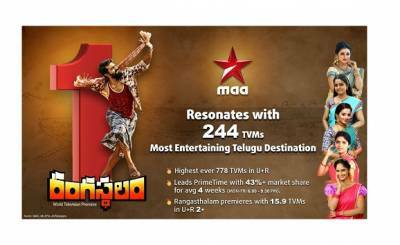 Star Maa, in its journey to be the most loved destination for Telugu Entertainment has consistently been leading the market with variety of genres from the best stories in primetime, blockbuster movies to international non-fiction format shows. The channel has recorded an unprecedented leadership of 60% over its closest competitor in Wk’42 of the BARC ratings. Star Maa also ranks No. 3 nationally. Most awaited World Television Premiere “Rangasthalam” delivered 15.9 TVM. With new Prime Time launches and Maha episodes in the fiction space during the festival season, Star Maa showcases the festivities and traditional values which is loved by the viewers.